The magazine will be out in print soon, enjoy online till then! Hope everyone is enjoying the holiday weekend! Just arrived back in NYC, and today is all about unpacking, working, and satisfying this uni craving I cannot shake. I love the thrill of traveling frequently on assignment – it gives me this crazy adrenaline rush that last for weeks. The decompress time that comes after each trip is equally rewarding. And no matter what, I still tear up when I spot the Manhattan skyline on cab rides home from the airport. I’ve had more than my share of pinch me, is this real? moments this year. And hope for a bazillion more to come. In the meantime wanted to share a new column I’m doing for Hamptons Magazine this summer. 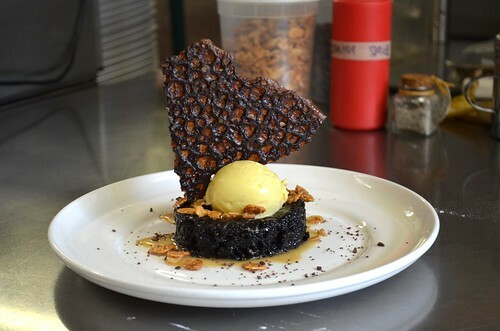 East End Sweets will run every Tuesday till Labor Day – all desserts! Last week we featured a behind-the-scenes look at the East Hampton classic, Nick & Toni’s. This Chocolate Grappa cake was easily my favorite on the menu – heady with grappa baked into the batter and poured over the dark chocolate cake. Devouring it straight from the oven was a pinch me moment as well.